We know how important your wedding day is to you and it’s equally important to us that we deliver a (Parlor) perfect style and experience that makes you look and feel beyond gorgeous. Includes consultation and extended time with our artists to help define your wedding day vision. Bridal Hairstyling includes clip-in hair extension placement (if applicable), & veil placement. All makeup services include full-face makeup application, false lashes, & neck/chest bronzing. Bridal Makeup also includes a take home lip color. This may include hair or makeup services for an engagement, bridal, or boudoir photo shoots. To schedule a bridal trial, book a bachelorette celebration, engagement or boudoir photo shoot or to schedule an appointment for your rehearsal dinner please reach out by filling out the form below. We’d can’t wait to work with you on your wedding day. We’ve worked with many brides (and grooms) to help them and their bridal party look and feel amazing for their special day. "If I sound crazy enthusiastic, it's because I am. 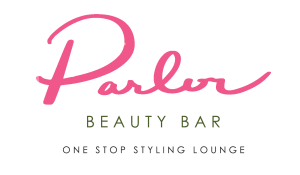 This is seriously one of my favorite places in all of Austin and some of my favorite people in Austin.About a year ago I needed someone to do my makeup for my engagement photos, and Parlor was fairly new but had good reviews, so I thought, ok, cool, I'll try them out. And DANG guys, they knocked it out of the park. They're not only the *best of the best* at what they do and are professional and always on time, they are all SO fun to be around. I loved them so much I decided to book them for my wedding for hair and makeup -- and guys. Best decision EVER! They made the whole process SO seamless and the stylists came to my house to do the bridal party's hair/makeup, my mom's hair, and mine, obvi!The stylists and artists made it SO fun and even finished everyone's hair and makeup with a couple minutes to spare -- when does that ever happen?! I've been in 9 weddings (I know) and that's seriously never happened.As far as everyday services go, I now go to get my brows done and it's a great experience. Always on time, consistent, and I won't let anyone else touch my eyebrows now, ha! "You'll love the way you look. I guarantee it." - Men's Warehouse but should also be Parlor Beauty Bar's tbh"
"My wife used their services for our wedding with her 4 bridesmaids and they all talked about their hair and makeup more than the wedding and reception.Highly recommend this beauty bar for weddings if you want to feel your best and have a happy wife." "Is it sad that I'm a guy and I'm leaving a 5 star review on here for this place? NO! My girl loves this place! We came down for a friends wedding and she wanted to go somewhere to get her hair done. We came here without an appointment and the ladies that worked here were able to accommodate her on an extremely busy Saturday afternoon. Lacey did my girls hair and my wife was gushing about the service. I think my wife got her hair done and some makeup applied. The hair was all soft curly and not like the usual long curly strands it is. She also had some makeup done. Seriously on the car ride back to the wedding hall, my wife talked about her hair and Lacey the ENTIRE time. Whatever Lacey did for my wife, she loved it!I'm not sure how much money my wife spent here but based on her appearance (didn't look that different if you ask me) and her attitude, it was worth every penny. If we were to every come to Austin again, my girl already said this is the first place we will go!" "My first "blow out" experience...I had a wedding to go to and just didn't feel like doing my hair, and I noticed this new place in my neighborhood. I had no idea what to expect or what I even really wanted, but I am SO glad that I went! My hair looked amaaaazing--it's literally never looked that good, not even on my wedding day! Marina showed me several different options, which I loved, and she really listened to what I wanted. The salon itself is super cute and everyone there was so nice. I will for sure be back. I don't often post Yelp reviews but this is a new LOCAL business that I think deserves kudos and customers!" "I had my hair styled by Jessica and it looked amazing!!! It was drizzly and humid that day but my style lasted for 2 more days until I washed it. Parlor is super cute and so is Jessica! She knows how to optimize your hair length and consistency to make it look it’s best. I highly recommend Parlor and ask for Jessica!" • Trials or other non-wedding day appointments may require a 50% deposit. • All hair must be dry and clean at time of appointment. •Hours/Holidays: Appointments before 7am or on any major US Holiday will incur an additional fee. • Valet/Toll: Parking, valet, or toll fees will be included into the final bill, and are due on the day of services. • Minimums: Booking minimums start at $1,000 for all weekend weddings scheduled during peak seasons. Exceptions may be made for certain dates, so please ask! • All services include 5 mile round trip complementary travel. Appointments that exceed the complementary miles will be charged at the artist’s discretion. • Other conditions, and policies may apply. All pricing policies are subject to change without notice. • Card Transactions: Credit/debit cards are accepted & require an additional 5% processing fee.